I’ve been asked a few times – what is a diode? Well, a diode is an electronic component that conducts current in one direction and blocks current from flowing in the other direction. In the circuit above the diode is connected in the right direction. This means current can flow through it so that the LED will light up. But what happens if we connect it the other way around? In this second circuit the diode is connected the wrong way. This means that no current will flow in the circuit and the LED will be turned OFF. What Is a Diode Used For? Diodes are very often used in power supplies. From the power outlet in your wall you get alternating current (AC). A lot of the devices we use need direct current (DC). To get DC from AC we need a rectifier circuit. 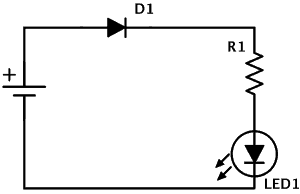 It’s a circuit that converts from alternating current (AC) to direct current (DC). 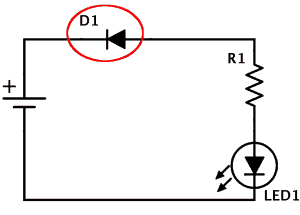 Diodes are the main components in rectifier circuits. 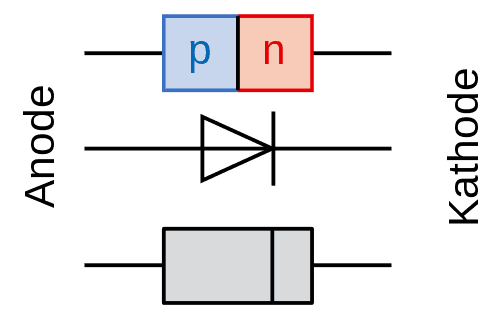 The diode is created from a PN junction. You get a PN junction by taking negative doped and positive doped semiconductor material and putting it together. At the intersection of these two materials a “depletion region” appears. This depletion region acts as an insulator and refuses to let any current pass. When you apply a positive voltage from the positive side to the negative side, the “depletion layer” between the two materials disappears and the current can flow from the positive to the negative side. When you apply a voltage in the other direction, from the negative to the positive side, the depletion region expands and resists any current flowing. You have to apply enough voltage in the “right” direction – from positive to negative – for the diode to start conducting. Usually this voltage is around 0.7V. The diode have limits and cannot conduct unlimited amounts of current. Diodes are not perfect components. If you apply voltage in the wrong direction, there will be a little bit of current flowing. This current is called “leakage current”. If you apply a high enough voltage in the “wrong” direction, the diode will break down and let current pass in this direction too. There are many different types of diodes. The most common ones are signal diodes, rectifier diodes, zener diodes and Light-Emitting Diodes (LED). Signal and rectifier diodes are pretty much the same thing except that rectifier diodes are built to handle more power. Zener diodes are diodes that make use of the breakdown voltage when applying voltage the “wrong” way. They act as very stable voltage references. Also have they made any transformer less voltage reducers for a hobby user. Say 120 AC to 12 AC volts. Are “wall warts” transformerless or do they have small gauge wire windings inside ? Yes, many of the standard wall adapters are transformer-less these days. Hi, Thanks for this quick section on diodes. I understand why one would use this in a power supply since AC goes back and forth and you only want one direction in DC. Could you pass on some more info on why they would be used or which other situations you would need this in a circuit? Thanks again or the help. But you can use it to protect your circuit from damage if someone connects the battery in the wrong way (minus on plus, and vice versa). And another very common use is the fly-back diode. It’s a way to protect your circuit from voltage spikes created by motors or relays. Thank to author who had presented a valuable article. I have a suggestion : the figure should be equipped with the plug and socket for easier understanding how a diode work. .
Great artical, very insightful! Thanks for making this great website! I was intimidated by electronics but this site has Given me the confidence to pursue my new hobby!! You rock!!! regarding to Zener diode,what do you mean by saying it acts as a very stable voltage references? For example a 4.7V zener diode will have a 4.7V drop in the reverse direction. This you can use for a stable 4.7V reference to for example a analog to digital converter. It won’t let you source a lot of current though. I never done any circuits, but I need to drop from 5 to 4 volts without any ICs, because they cost money. So I take two diodes sequental to drop around 0.5v on each (from a bridge) and add 5w 47ohm resistor to drop current (I use ATX PSU) and a 3300uF 10v capacitor as a filter and stabilizer, and before all that someone recommends to add an inductor to build more complete filter. I have also three shottka packs, two for 40A and one for 15A, but I think it is not possible to use them for that “dc-dc converter”. Btw I need 4.2v and 2-3 A of current, which make me sad. Yes it is broken tablet that can only run from cable soldered to battery contacts.